The stage is set, but will the fight deliver? Other than Edgar/Maynard I, I can’t recall a 25-minute title fight packed with more excitement. The bout ebbed and flowed with the grace of a homicidal ballerina. Hendricks took the early lead, peppering Lawler with savvy combinations of leg kicks and jabs. All Lawler could do was smile and punch. While both men had their moments in the opening rounds, it appeared as though Hendricks gripped tighter to the judge’s scorecards. Then came round three. Lawler hurt Hendricks badly, but what could have been a stopping point resulted merely in a turning point. Looking to stay patient and conserve energy, Lawler stalked Hendricks with the calmness of a breeze. He connected and connected and connected, but failed to demolish. The abundance of time remaining in the round should have facilitated a finish, but ironically, it coaxed Lawler into fighting at a pace that ultimately worked against him. He sacrificed risk and reward in honor of caution. I can’t blame Lawler for fighting as he did — hindsight is 20/20 — but would Hendricks have survived round three had Lawler unleashed a Liddellian flurry? That, we’ll never know. 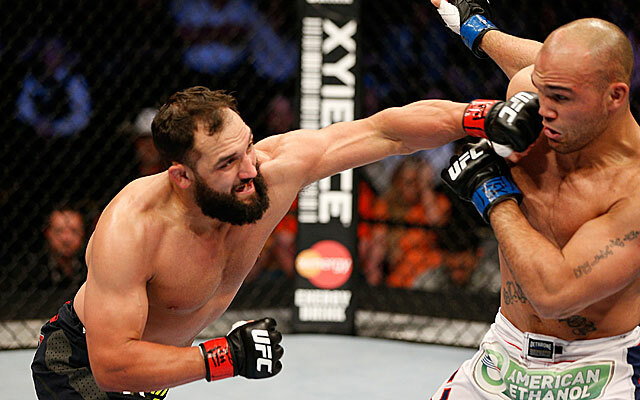 Round four featured similar themes — Lawler asserted himself while Hendricks survived. Just like previous rounds, both fighters had their moments, but in this case, it was Lawler who tightened his grip to even the score. With one round to go, it was anybody’s fight. Round five started much like three and four ended — with Lawler riding a wave of momentum. But then, something happened. Hendricks seemed to remember that a robbery took place at UFC 167 — a crime had been committed but nobody paid. But, somebody had to pay. In fact, anybody had to pay. Fortunately for Hendricks, it was the middle of a war — unfortunately for Lawler, he was in it as well. Hendricks surmounted an offense that seemingly emerged from nothingness. Who will Hendricks fight next? I don’t see GSP coming back so soon, nor do I see Lombard jumping the queue after a cautiously competent victory over Jake Shields. Rory MacDonald isn’t the worst choice, but losing to Lawler in November doesn’t help his case. Woodley seemed to think a victory — by any means — secures a title shot. While Dana White confirmed as much for Condit, he hasn’t said so for Woodley. Winning by injury doesn’t help either; this leaves us with Lawler and Diaz. It wouldn’t be shocking if Diaz got an immediate shot, but it’s highly unlikely. The fairest outcome would be pairing Woodley and Diaz on the undercard of Hendricks/Lawler II. If Lawler takes the rematch, there are more than enough combinations between Woodley, MacDonald, Lombard, Diaz, Ellenberger, Kim, Nelson and Brown to keep the division interesting during the rubber match. The UFC could also keep the Diaz/Lawler grudge match in tact by putting them on the undercard of Hendricks vs. Woodley in a Title Eliminator. This would allow the UFC to promote a fresh title fight while forcing Diaz to prove he’s a worthy contender. It would also align the Hendricks/Lawler rematch in case of a Diaz loss. Ultimately, the UFC Welterweight picture is seems stacked — and that’s without GSP or Carlos Condit. It’s hard to predict what will happen next, but regardless of who fights whom or who wins what, it looks like the fans will be sitting pretty for the foreseeable future. Click HERE to follow TheBeardedPoet on Twitter.